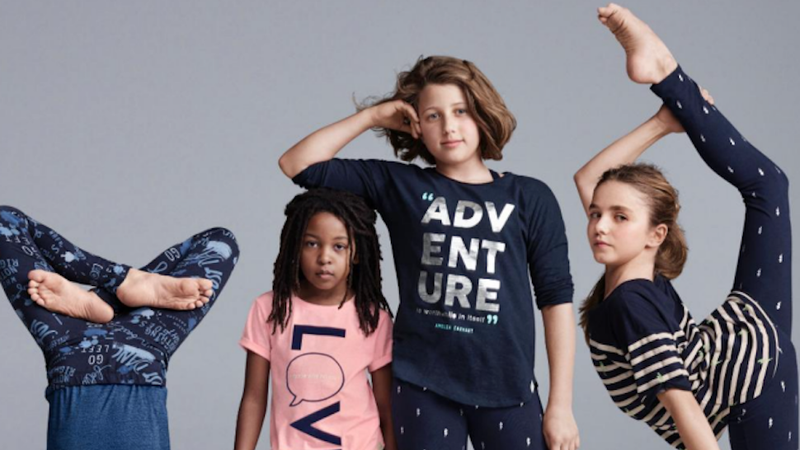 Following complaints, Gap, Inc. has deleted a tweet advertising Ellen DeGeneres’ GapKids X ED clothing line with an image featuring child acrobats Le Petit Cirque. Critics claim the photo—depicting four girls—uses the lone black model as a passive prop, while the other models appear active. The photo—accompanied by a tweet reading, “Meet the kids who are proving that girls can do anything”—shows the girls in various stages of acrobatics, with one in a headstand, one stretching her leg behind her, and—in the center—the group’s tallest girl resting her elbow on the head of the one black acrobat. “While all of the girls are adorable, and indeed, all of them should grow up to be and do anything, it becomes problematic when the black child is positioned to be a white child’s prop,” wrote Kirsten West Savali for The Root. Gap, Inc. received many tweets complaining about the image and “passive racism” therein, leading them to remove the photo, replace it with another one, and release an apology. Gap heard the message from Twitter users loud and clear. The retailer, like many others, monitors social media closely, listening for any discordant notes. Social media outrage had reportedly died down by Tuesday. The new tweet includes a video featuring DeGeneres—who partnered with GapKids for X ED to “motivate young girls–and boys–to celebrate what makes them unique”—and Le Petit Cirque (as well as the campaigns other models) interacting on set. Another tweet (still up on the GapKids Twitter account) includes the original photo in a collection of four.